Both lamb and butter bean mash are favourites of mine so when I came across this recipe for lamb with a pesto butter bean mash I tried it right away. The dish is Gluten Free as long as you check that the stock cube you use is (Gluten Free stock cubes are pretty easy to find in any of the major supermarkets). Traditionally served in the spring and around Easter I think Lamb is good any time of year, the lamb steaks used in this recipe take less than 10 minutes in the pan to cook. The addition of crème fraiche and pesto to already creamy butter beans makes for a really smooth and tasty mash which complements the Lamb well. The slight sharpness of the tomato’s stops the dish from being too bland. So if you like lamb and you’re looking for something a bit different thats quick to cook and with easy to source ingredients then why not try this, it could be on the table just over 20 minutes after you get in the house from the supermarket. 150ml chicken stock, made with 1 Gluten Free stock cube – I use these. Preheat the oven to 180°C, fan 160°C. Put the tomatoes on a baking tray and cover them with ½ tablespoon of the oil and the dried oregano and roast them for 15 minutes. Meanwhile, heat 1 tablespoon of the remaining oil in a pan and cook the onion for 5 minutes, adding the garlic for the last minute. Then stir in the butter beans, stock, crème fraîche and pesto. Simmer for 5 minutes. Brush the lamb steaks with the remaining oil and season with black pepper. Heat a frying pan over a high heat, add the steaks and cook for 3-4 minutes on each side. Remove the steaks from the pan and allow them to rest. Add the spring greens to the pan and stir fry for 5 minutes. 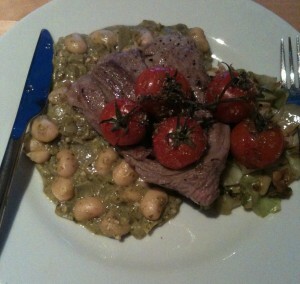 Serve the lamb steaks on top of the pesto butter beans and spring greens, with the roasted cherry tomatoes on top. Article posted in Dinner, Recipes on September 1, 2013 by Ray Smith.